Wintertime is an excellent season to get to know your neighbors, the birds. Buy a couple of feeders, a big bag of seed and prepare to be “up close and personal” with some flighty feathered friends. I’ve been feeding birds for many years and it’s thoroughly enjoyable. Takes the drab wintry blues out of the picture and gives you bragging rights at the Tuesday night bingo game. sophisticated cardinals, brazen blue jays, bubbly chickadees, sprightly goldfinches, unassuming Carolina wrens, drabby house sparrows, lively titmouse, hot-pink purple house finches, guarded nuthatches, red-chested grosbeaks, vigilant red-bellied woodpeckers, fickle downy woodpeckers, nervous hairy woodpeckers, and the dowdy strutting mourning doves. Fill your feeders and sit back to enjoy nature’s finest. …err, what’s that out there? Those darn starlings and blackbirds are back! Aargg! Today I tried a different strategy. I bought some scratch feed containing flecks of corn and all the trash seeds and poured a huge pile of it way, way out back, figuring they would be so busy eating that stuff, they’d leave the more expensive seed alone. My little “guys” would get to eat in peace. Nope. The black birds put out the word that there was more seed than usual and invited more of their kin. They are presently making short work of ALL the seed. I’d tie my two spaniels out there if that would scare the birds off, but the dogs are so spoiled their feet would freeze and I’d look out and see them rolled over on their backs like dead cockroaches. You know, I think those black birds are smart. They have it all figured out. They fly from yard to yard, checking out the neighborhood. Then they leave a lone sentinel posted in a tree to check for any new additions to the bird feeders. I refused to refill my feeders this morning and watched in horror and guilt as my favorites sat in the bushes in subzero temps waiting for me to feed them. I peeked out several times to check for blackbirds and finally after no sightings for a few hours, I relented and refilled the seed. I hadn’t completely thawed myself out from that exertion before I noted the brats were back. I was steamed! Not on my watch! Not in my neighborhood! Yeah, right. Sure, Lord, what does that have to do with blackbirds? I followed instructions and prayed about the situation a little. The revelation came quickly: leave the blackbirds alone and in due time, they will be taken care of by the Lord. In the meantime, enjoy the good birds. This entry was posted in Just a thought... and tagged Birds, blackbirds, Cardinals, feeding feeders, finches, hogs, Jeanne E Webster, NATURE, nuisance, sparrows, starlings, winter, woodpeckers, wrens. 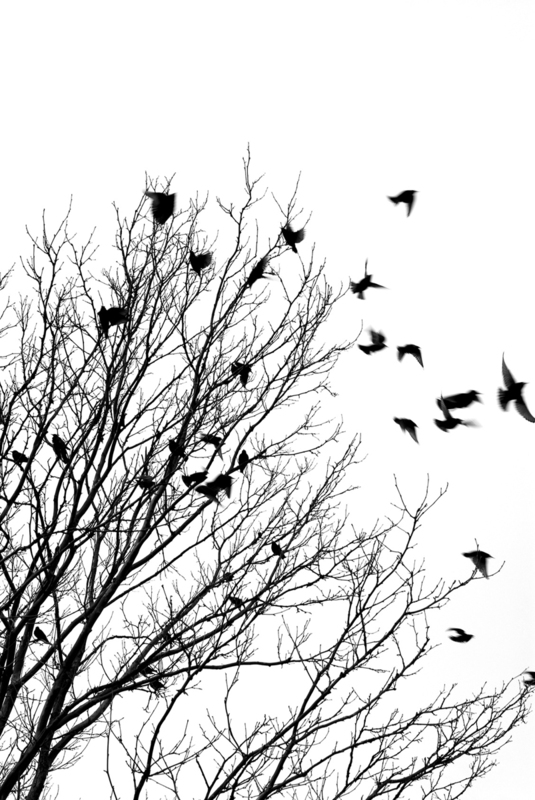 I thought birds fly south but this winter there have been soooo many birds including the ….black birds. But we have a new bird problem and they are…parakeets. They are VERY noisy and they tore up our trees last summer. We have so many birds on Long Island that I think they are taking over. We also have a tremendous amount of geese. The joy is looking at the cardinals…just a few of these. Does everybody else have so many kinds birds? Interesting plight, Tanya! I’ve heard of these parakeets years ago but didn’t realize they had become a problem. This time of year is migratory time for many birds, especially geese. Lovely time to bird watch. We have many types of birds here, as i wrote in the article. Such tiny things. The robins are back and getting ready to grow up another batch of babies. Love this!!! What a great message for those who are exasperated by “weeds” in their life. God is Wisdom and we can count on His Grace daily to take care of us as we put our trust in Him. Bless you, Jeanne! Thank you, Zoey, for your gracious support and sharing with the readers of Women’s Window.